This past week has been unseasonably cold in Brooklyn. Once upon a time, I remember winters where there would be snow on the ground from December to March and hats, scarves and gloves where essential, not just fashionable. Years ago, weeks like this would be a bit chilly but close to the norm. But these days, with the thermometer hovering around 40°F all winter, a morning in the teens (with a real feel of -1°F) is pretty damn cold. It’s the first time that I noticed my window’s aren’t as insulated as they should be and that draft from under the AC units makes the room really freaking cold. I’ve forced myself to go outside when necessary, even drag myself the chilly 6 blocks to the gym, but really all I want to do is stay inside, bundled in blankets, eating soup and stews. It always amazed me how much soup makes things better. A simple dish can soothe away the winter blues, cure (or at least help) a cold and warn the depths of your soul. The lack of cold winters actually disappoints me a bit. I hate the cold, probably more than most people. I hate the heat too, actually and think the weather should hover between 50-80°F always. But seriously, when it’s winter, you want soup. And really, who wants to eat a hearty bowl of soup when its 55°F and sunny outside? So for the past week we lived on soups and stews, and while I was cold and annoyed that I felt trapped in my own apartment, I savored every minute of cooking and eating. 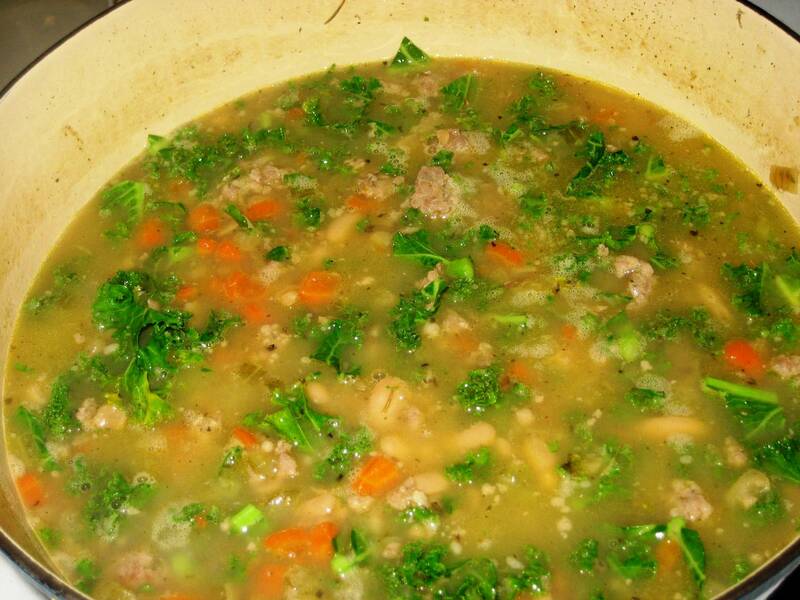 There will be more soup and stew recipes, I promise, but for now, one of my favorite standbys–Tuscan White Bean Soup. 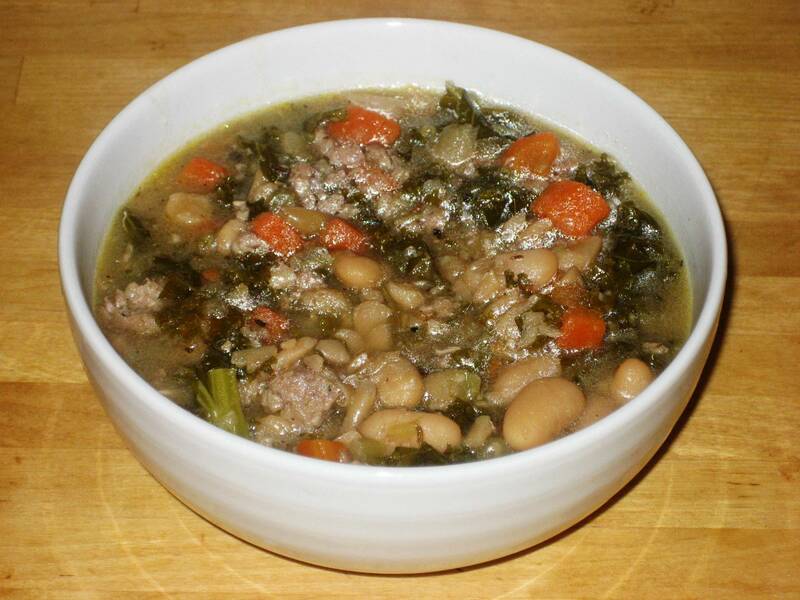 I use dried beans for this soup. You can speed it up by using canned beans, but I doubt the levels of favor will be the same. The soup cooks and simmers for most of the day, leaving your home smelling amazing and your mouth watering until dinner time. A few notes before the recipe: While escarole is the normal addition, I usually use whatever greens I have on hand. Spinach, chard and kale all work great. I added sausage, per my husband’s request, but the soup can easily be made vegetarian by just omitting the sausage. 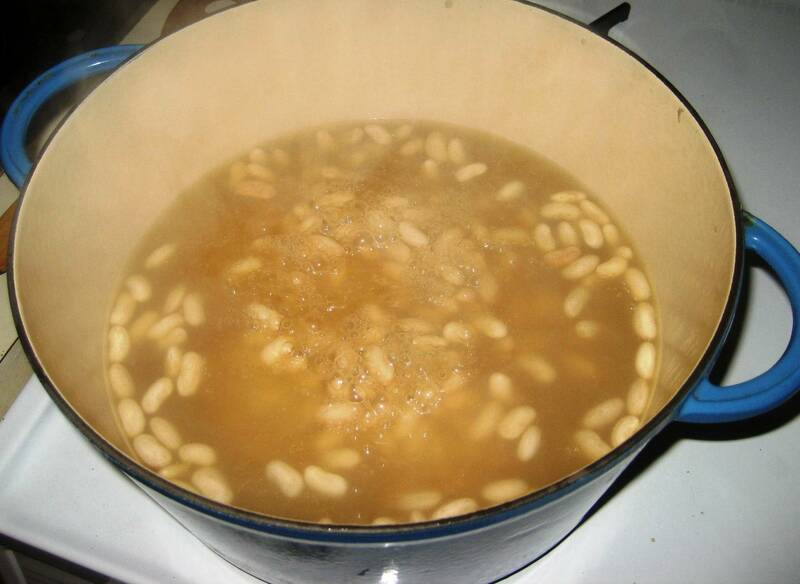 In a large dutch oven bring the cannellini beans and water to a boil. Reduce heat, cover and simmer for 1 hour until beans are tender. Break apart half of the beans with a potato masher to add a chunkier texture to your soup. Meanwhile, heat olive oil in a nonstick skillet. 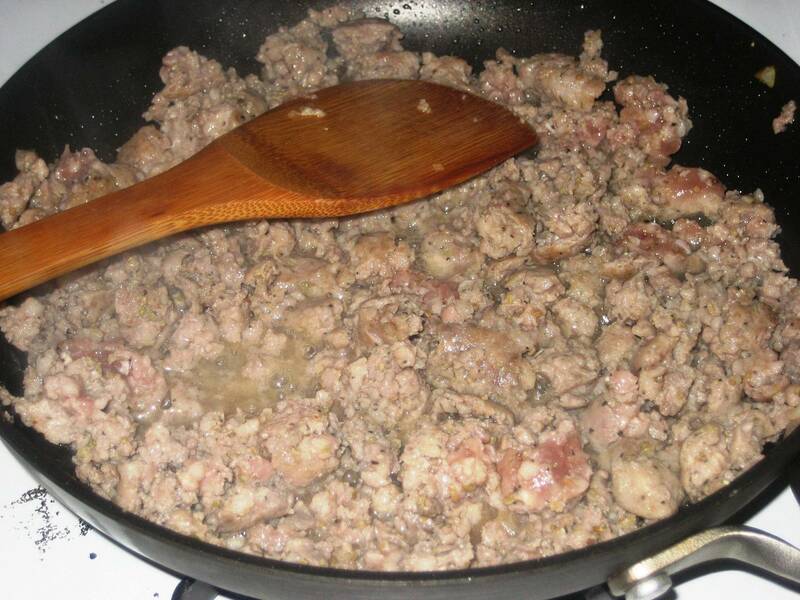 Add sausage, breaking apart with a spoon. When sausage is mostly cooked (barely pink), add onions and garlic and continue to cook until onions are translucent, about 5 minutes. Add sausage onion mixture to the dutch oven. 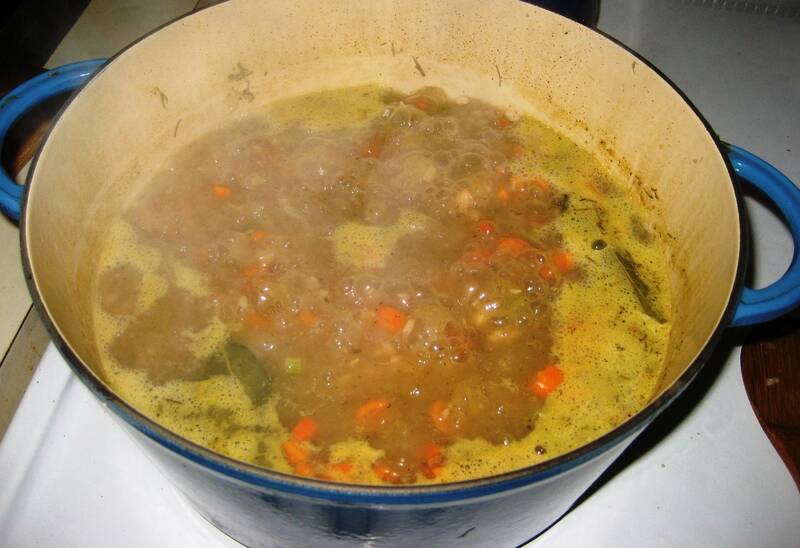 Add carrots, celery and broth and return pot to a boil. Reduce heat and add salt, peppers, bay leaf, seasoning, rosemary and Parmesan rind. 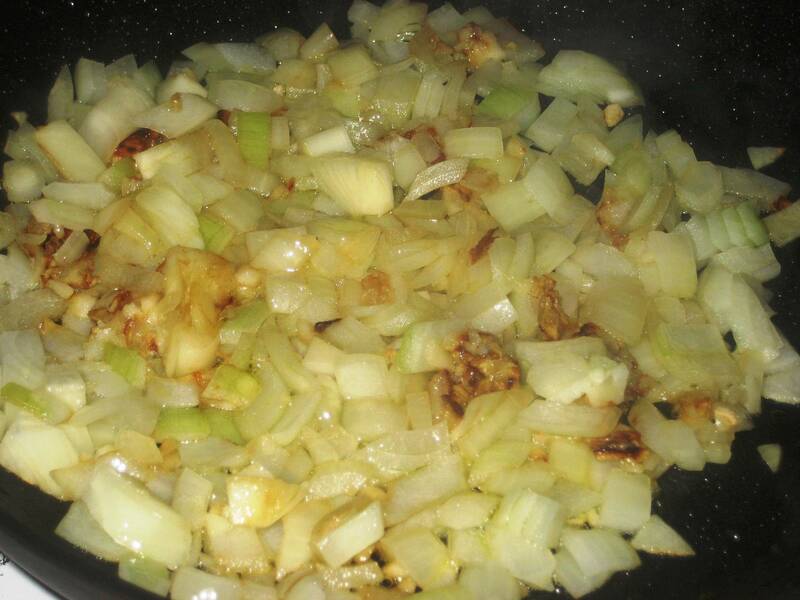 Stir until well blended then cover pot and simmer until vegetables are very tender. The pot should simmer for another hour or so; occasionally stir soup and add extra broth if the soup gets too thick (but we like it thick!). Taste and season with additional salt and pepper if needed. Remove bay leaf and rind. Stir in grated cheese until melted. Add kale and stir until all leaves are submerged. Continue cooking, covered over low heat until greens are bright and tender, about 10 minutes. Ladle soup into bowls and sprinkle with additional grated Parmesan, if desired. Serve immediately, preferably with crusty bread and butter. Thanks for linking my chicken chickpea and potato soup recipe. It’s really tasty. Your recipe looks fantastic too! Your welcome! And your soup recipe does look delicious. On my list to make! Do you still have this soup left? I might just come over lol. Looks so delish, esp on a rainy Mon.